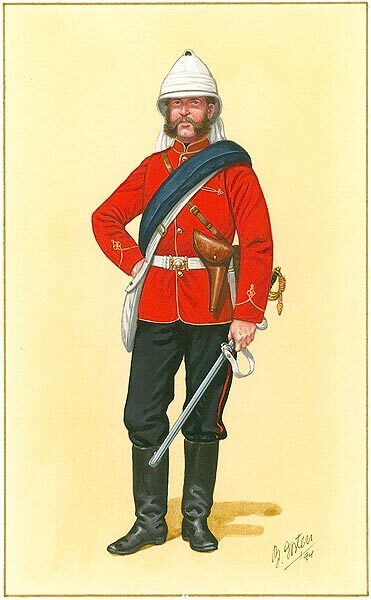 The Chinese War of 1860 involved the participation of an Anglo-French Expeditionary Force, which included 4 of the Regimental forebears of The Princess of Wales’s Royal Regiment were to be organised in each of the 4 British operational brigades. The aim of the British and French troops was to compel the Chinese Court at Peking ot observe the trading treaties signed between their governments at Tientsin in 1858. In 1859, Sir Frederick Bruce and Monsieur de Bourbolon, the British and French national representatives, prepared to take up their duties within the terms of the Tientsin Treaties and a British fleet made up of 19 vessels, under the Command of Admiral Hope, assembled in the gulf Pechili. On 17 June 1859, Admiral Hope, in a single vessel, proceeded to Taku to announce the arrival of of the 2 new officials. An armed rabble refused permission to land and said that the River Peiho had been blocked. After some failed negotiation, on 25th June, Hope attacked the Taku forts with gunboats and detachments of sailors and marines. The result was disastrous with 4 boats sunk and the shore party mown down in mud. 434 men were killed or wounded out of 1100 disembarked. Hope’s gunboat had 9 standing out of 40 and the position would have been worse, had not Commodore Tatnall of the American Navy come to Hope’s assistance with his armed barge. The British Prime Minister, Lord Palmerston, was convinced the enemy guns must have been manned by Russians to have been so effective! 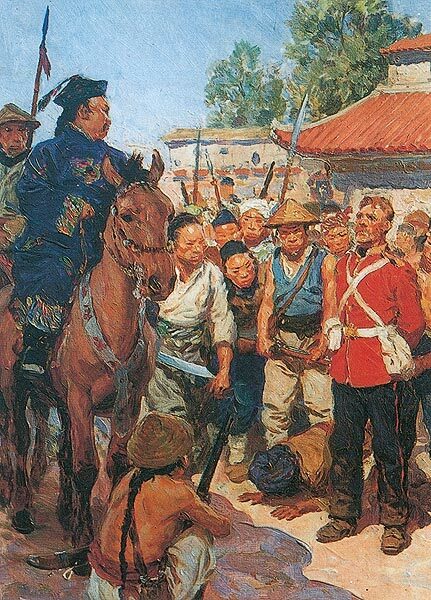 On 8 March 1860 an ultimatum was sent to Peking demanding an apology and the acceptance of the Treaty of Tientsin. Hostilities were threatened if a response was not received within 30 days and, a negative answer from the Chinese was received 2 days before the deadline. The result was the Chinese War of 1860. Sir Hope Grant, a cavalryman, was appointed the commander of the China Expeditionary Force. He was a fine horseman and an accomplished cellist. He was also known for being religious and brave, but particularly inarticulate on paper! The French commander was de Montauban and in theory the two were supposed to command the Force on alternate days! Cavalry Bde. Brig Gen Pattle. (Kings Dragoon Guards). 1 KDG, Probyn’s Horse, Fane’s Horse, Stirling’s battery. 1st Bde: Brig-Gen Staveley CB. The largest of the infantry battalions with 30 officers and 970 ORs, 15th Ludhiana Sikhs. 2nd Div: Maj-Gen Sir Robert Napier KCB. 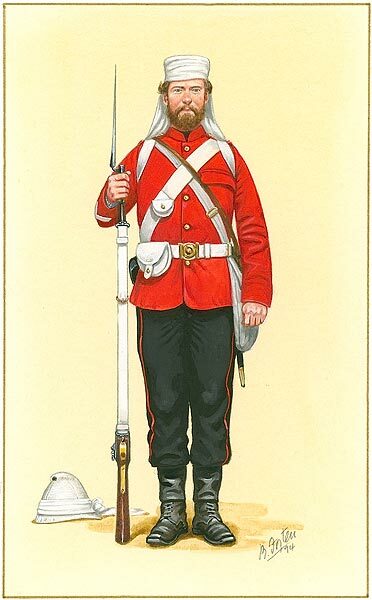 3rd Foot (The Buffs), 44th (Essex Regt), 8th Punjab NI. 67th (South Hampshire), 99th (Wiltshire), 19th Punjab NI. Naval Force 173 British vessels and 33 French. The initial action of the campaign was for the British and French Force to land troops on Chusan in order to starve the population of Peking. The landing was successful, but had no strategic effect, as the location was too far from Peking. None of our forebear regiments were present. On 30 July 1860, Sutton’s Brigade was disembarked at Pei Tang-Ho and Pei Tang was occupied. The first troops ashore were 200 Queensmen and 200 French, who had made a reconnaissance of the town. 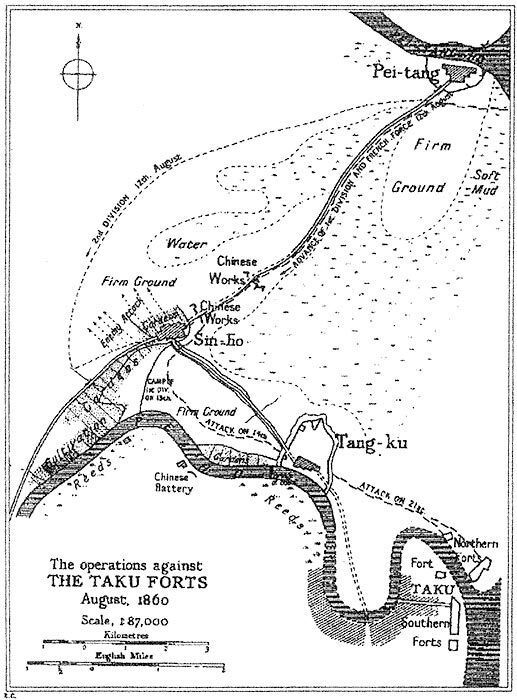 On 3rd August, a reconnaissance force moved to a position 10 miles away from Taku Forts. 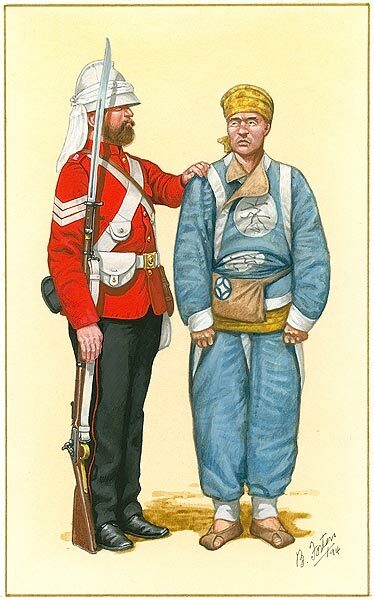 A 2nd Queen’s detachment took part and 2 of its soldiers were wounded by bullets from a Chinese Jingal. (This was a huge musket manned by a 3 man crew). On 12th August the 1st Division and the French Force advanced south-west along the causeway to Sin-Ho, whilst the 2nd Div advanced with cavalry on a different axis, swinging to the west in a right hook. The cavalry was confronted by a large body of enemy Tartan horse, which only retreated after allied artillery fire and a charge by Probyn’s and Fane’s cavalry. Meanwhile, the 1st Division took the Chinese entrenchments on the causeway and advanced into the village of Sin-Ho. The next Chinese emplacement were at Tang-Ku. The approach was awkward with a ditch on either side, swamp to the north and the River Peiho to the south, so on the night of the 13th the gaps were bridges. On the same night the 31st (Huntingdonshire) with 250 men of the 60th Rifles and a party of Madras sappers and miners moved within close range of the town and dug a long shelter trench. On the 14th Tang-Ku was attacked and taken by the 2nd Brigade and the French. The 2nd Queen’s were in the centre during the assault and 2 of the regiments soldiers were wounded. 100 Chinese were killed and 45 guns captured. 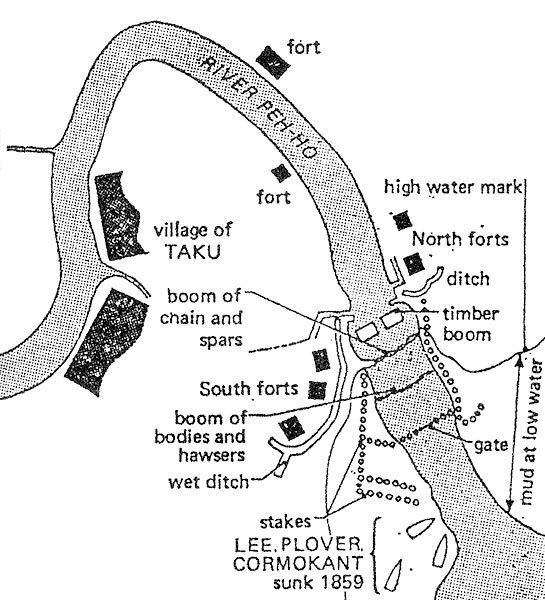 There was then a halt for 5 days, as preparations were made for the assault on the Taku forts mainly by the 2nd Division, which was commanded by General Napier, an accomplished engineer. Two companies of the Buffs under command of Colonel Sargent had a series of minor skirmishes with the enemy during this period. A bridge of boats was put up over the River Pei-Ho and the two commanders carried out their reconnaissance. On each bank of the River Pei-Ho there was a detached fort lying to the west of a larger fort. The detached 130 square yards of mud fort on the north bank dominated the approaches, so it was considered by General Grant to be the vital ground of the position, which needed to be taken first. Montauban did not agree and thought that Grant was taking too great a risk, as he would not be making the most of his naval firepower, but later accepted the plan. He had preferred a more direct simultaneous assault against the forts on both sides of the River. 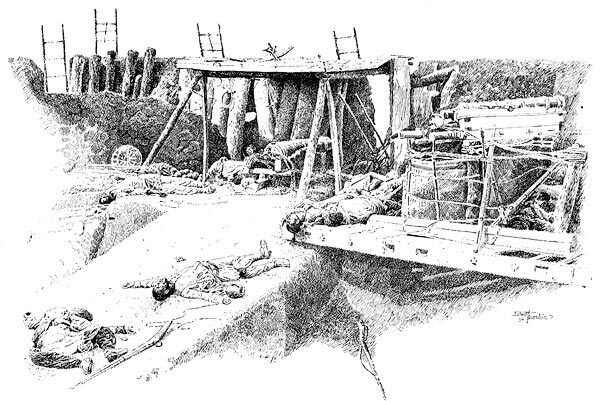 Twenty-three artillery pieces were positioned facing the fort and gaps were bridged. The deep mud made their movement extremely difficult. Some guns needed a team of 6 horses to pull. In general, the ground was all mud and swampland with deep water courses intersecting it in all directions. General Grant stated that “It is simply a matter of the degree of filth our men must traverse”. For part of this stage of the campaign the headquarters of the 1st Division was under a foot of water. The Chinese defences consisted of a deep ditch, a blocked gap, a wet ditch, 20 feet of ground covered with pointed bamboo stakes, a second wet ditch, another staked space and finally a thick brick wall with loopholes for artillery pieces. The assault across the 4 mile gap from Tang-ku began on 21st August, at daybreak with artillery fire and diversionary fire from 4 French and 4 British gunboats on the southern forts. Brig Reeves commanded the British assaulting troops of 2500 men. The French assaulting force consisted of 700 men under General Collineau. Four 8-inch guns, two 8-inch howitzers, two 32-pounders and three 8-inch mortars provided indirect fire support. The 37 Chinese guns fired from the northern fort, as the allied force advanced, but most rounds went over the heads of the allies. At 6 o’clock the powder magazine blew up, followed by another in the larger fort 30 minutes later, which was probably hit from a shell from an allied gunboat. The navy was now bombarding the Chinese positions from the west. The 44th and 67th (South Hampshires) advanced upon the gate, with the French, under General Collineau, on their right next to the river. The 67th was to gain its four VCs in this battle. Coolies carried scaling ladders for the French and stood in the water up to their necks holding the ladders up to make bridges above them. They were preceded by sappers carrying pontoons for crossing the obstacles, but they got in the way and held up the advance. The 67th had to swim across ditches. A Maj Anson, General Grant’s aide-de-camp, and Lieutenant-Colonel Mann of the Royal Engineers cut the ropes of the drawbridge and the drawbridge fell down. However, the gate was still closed, with a shell-hole next to it. Lieutenant Nataniel Burslem of the 67th headed for it, even though he had received a bullet in the chest. He was joined by Private Thomas Lane, who tried to enlarge the shell-hole, but was stunned by a 12-pounder shell. He got up, but was spiked by an enemy bayonet. In spite of their difficulties, both men continued to enlarge the hole until it was big enough for a man to get through. 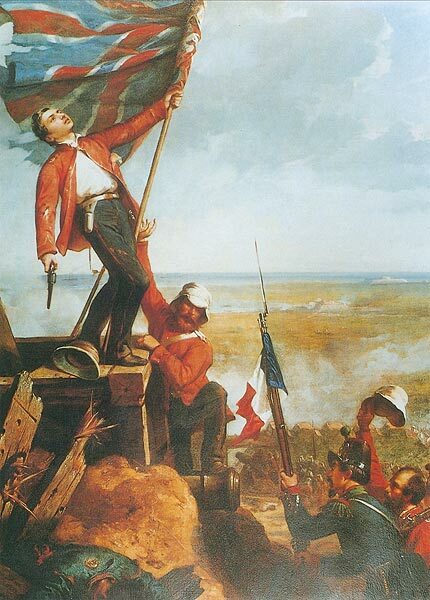 The French got into the fort first closely followed by Ensign John Chaplin carrying the Regimental Colour of the 67th and another officer of the Regiment, Lieutenant Edmund Lenon. Chaplin was hit twice by bullets in the forearm and shoulder, but both officer climbed up the wall and reached the parapet. Chaplin was then again wounded-this time in the abdomen, but he succeeded in unfurling the Colour and supporting it in place of the Chinese flag. At the same time Lieutenant Rogers of the 44th assisted him. After three and a half hours of fighting the fort was taken. Burslem, Lenon, Chaplin and Lane were all awarded Victoria Crosses, as was Rogers of the 44th. The Buffs and the 8th Punjab Infantry then advanced on the second lower northern fort, which was a thousand yards away amid a deluge of rain and a sea of mud. 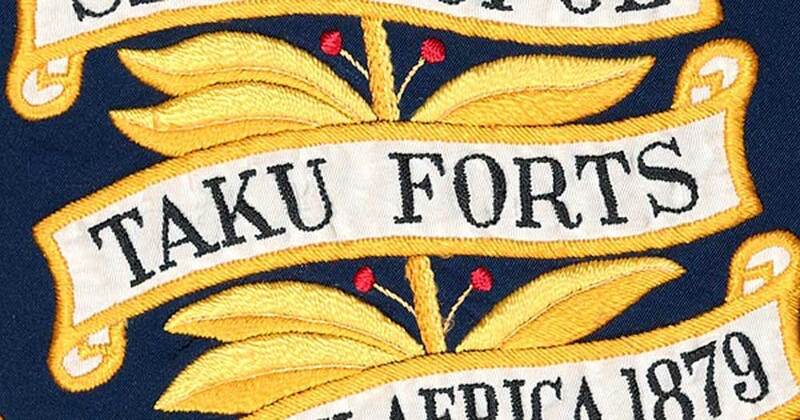 A staff officer advanced to examine the scene, but a white flag was seen flying from one of the southern forts and 2 hours later all enemy positions at Taku were occupied. The southern forts were seen to be totally dominated by the first fort captured. 67th South Hampshire - 6 Killed, 71 wounded. The total allied casualties were 201 British and 158 French, whilst 1800 Chinese died, with 1500 fleeing the scene. 2000 Chinese along with 400 guns were captured. The 2nd Queen’s Royal Regiment was transported to England via HongKong. The Buffs garrisoned Taku Forts. The 31st and 67th garrisoned Tientsin, following its surrender and occupation.